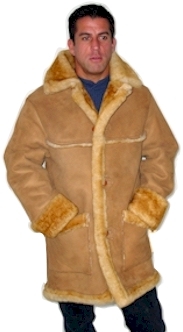 Men's 3/4 length sheepskin coat. This is a casual coat with an easy fit and as with all of our sheepskin coats, it has all the warmth of 100% real sheepskin. Four buttons and adjustable cuffs. Available in stony tan (color shown) or Icelandic colors. The Stony tan is made from domestic pelts, which are medium weight skins. The other colors are made from Icelandic pelts which are a lighter weight, exceptionally soft and supple hide, with equally soft fur and they're available in five different colors. Same as above but in a roper length.